I have not tried this yet but have received updates on the Sole Mates Dual Sided Foot File, which features two specialized tools for expert pedicure maintenance: a professional quality, safe-to-the-touch stainless steel micro-file and an equally high quality finishing file. The stainless steel micro-file quickly, easily and very gently removes calluses and rough dead skin, while the finishing file buffs the skin to soft, touchable smoothness….if anyone tries this out, do leave comments if this works. As first of its kind, the dual sided foot file boasts an ingenious magnetic design that holds both parts together. It’s uniquely shaped built-in case is contoured for excellent ergonomic function, comfort and control, as well as convenient, compact storage. Both parts fit together effortlessly to keep the tools clean and protected and always accessible for pedi pampering at home or on-the-go. 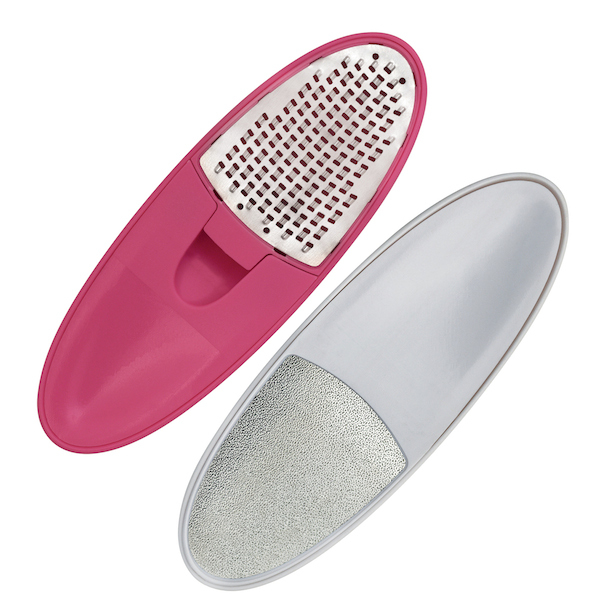 The pink Sole Mates Dual Sided Foot File are available in Harvey Nichols, Bloomingdales, AREEJ, Tavola, Salam Studios, Boots Pharmacy and Zwilling J.A. Henckels Stores across the GCC for AED 115.